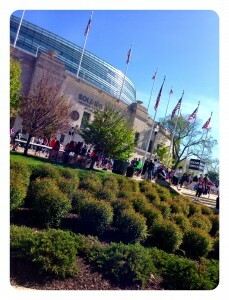 My favorite weekend of the year involves my favorite road race of the year, the Soldier Field 10-Miler. It’s a race I look forward to with childlike excitement. This year was special, both my husband and I were running – just like good ol’ times – while our 2.5 year old twins were home with Grandma. Fleet Feet Sports Chicago has been hosting this event for 11 years, and each year it gets better and better. Kudos to Fleet Feet and ALL the amazing volunteers who make this day memorable for so many. My goal for the race was to best last year’s time, 1:21:34, an 8:10 pace. I knew it was going to be work, and I was feeling a bit nervous to have a time goal. 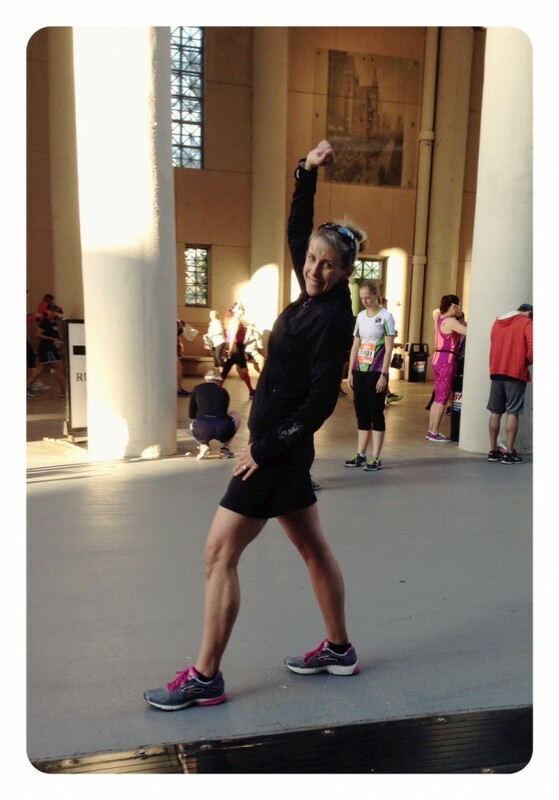 Last year I showed up on race day (see 2013 report here) with a strained hamstring and was just out there to have fun, but somehow managed to run one of my best 10-milers. 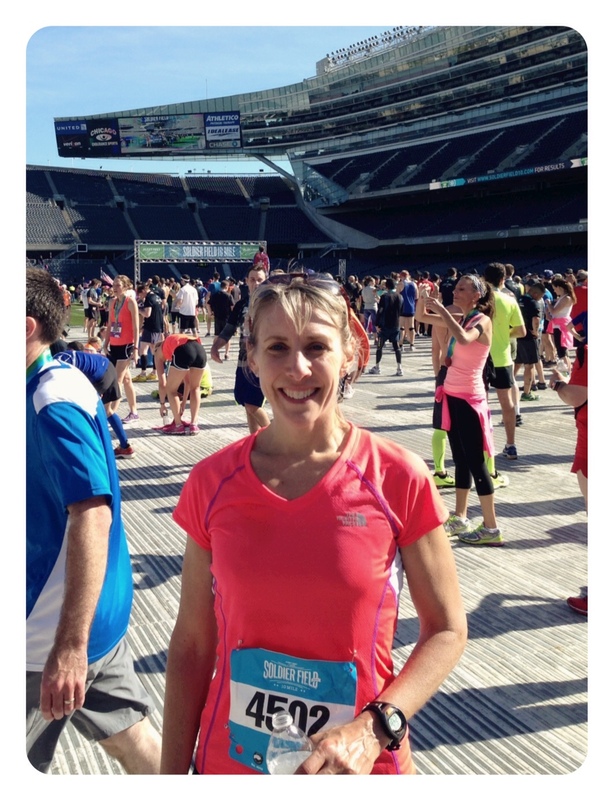 So being healthy this year and with more training under my belt, I HAD to beat 2013’s time. The best part of the 10-miler is they stagger the beginning of the race by corrals to keep the runner’s on the course evenly spread out. Coral #3 horn blared at 7:08am and off we went. I found my partner, his name was Terry, and ironically he is applying to be a Nike Race Team pacer for the Chicago Marathon. We were a perfect fit, until Terry and I crossed the first mile marker. We ran a 7:50 minute mile. While it was comfortable at the time, I thought I should dial it back. Mile #2 came quick because we were chatting, 7:48. Woah. Third mile was just a fast, 7:55am. I told Terry I was having an internal conflict. While the sub 8-minute miles felt relatively comfortable, I was worried I was going out too fast and I would pay the price soon. I haven’t been training to run 10 miles at a sub 8-minute pace. We dialed back on mile 4, it was an 8:00 minute mile – our goal pace – which was still aggressive for me. At mile 4 I started to think that I could and should push for my 10-miler PR (personal record). In 2007 I ran Soldier Field at a 7:55 minute-mile pace, 1:19:10. “I could do this, I just had to hang on” is what I told myself. The turnaround point for the out and back course is near, and it definitely provides a psychological boost to run back toward Soldier Field. We pass mile 5, 8:01. Terry is right by my side and asks how I’m doing. I push out ‘good, but my legs are starting to feel heavy”, and he can tell I’m breathing heavier. I am certainly feeling the first five miles. I’m having more internal dialogue in my head since I can’t talk so much to my partner. I begin to think about all the women I train in Active Moms’ Club and how I ask of them to push to their limit. I am pushing, and I appreciate all the effort my clients give to me. This hurts, my legs are getting heavier. At mile 6 I hit my split time and glance down at my watch, 8:05. I’m still in awe I’m holding this pace and very worried that I’m going to ‘crash’. I pull out my espresso flavored GU with caffeine and take little pulls on it for the next mile. Fully aware GU works more effectively with fluids, I decided I would not stop for water. I knew each second was going to count at the end, and today I did not want to waste those few seconds on water. By mile 7, I came to the realization that the pain I was feeling had to be endured for the rest of the race. It was a new threshold of discomfort, and truthfully, only known on race days. Slowing down or stopping was not an option. I was going to push through the next three miles with all I had to get to the finish line. My split for mile 7, 8:12. Terry continues to check in with me at every mile marker. I made every effort to keep him in my sights because he was still on his 8:00/minute-mile pace and now 10+ feet ahead of me. Mile 8 felt like forever, my split, 8:11. The internal negotiations continued. I reminded myself that my original goal was to best last’s year time (1:21:34), it was only after I started off with sub 8-minute miles that I changed course for a PR goal. Mile 9 is FINALLY here, thank goodness. I’m hurting. Every morsel in my being wants this race to be over now. My split at mile 9, 8:14 and total time on the course 1:12:20. More internal negotiations continue. I have exactly 9 minutes to cross the finish line to beat last year’s time, and IF I can manage to push out another sub 8-minute mile, I CAN PR! I’m pushing. I’m forcing long deep breaths. Terry is in my sights. I’m giving everything I’ve got. As I dip under the tunnel and run through the concourse of Soldier Field everyone around me is taking off, literally sprinting to come up out of the tunnel, just as the Bears do on game day. I’m on the field and my eyes are locked on the finish line. I cross and hit the split on my watch and almost collapse. Ironically a friend, John from Fleet Feet Sports, is at the finish and congratulates me while grabbing me to hold me upright. I was lightheaded. I LEFT IT ALL OUT THERE. ALL OF IT. John passed me to a medical volunteer and she stayed with me until I felt stronger. After I got my bearings, I looked down at my watch not knowing my finish time. My pace for mile 10, 8:16. I DID IT! I achieved my goal to beat last year’s race, final time 1:20:37. It’s my second fastest 10-miler on the books! After I guzzled some water, I went to meet my husband (finish time 1:13:07) who was waiting for me at the runner’s meetup. We shared our race stories and went out to have a well deserved brunch at The Bongo Room. I love racing. “Pain is temporary, but pride last forever”, it’s my mantra. 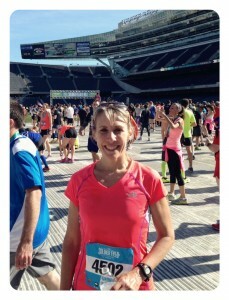 I’ll be back to Soldier Field next year with a goal to run a PR. In the mean time, I’m looking to register for another race this summer, maybe it will be triathlon??? Did you run Soldier Field this past weekend? Tell us about your run.